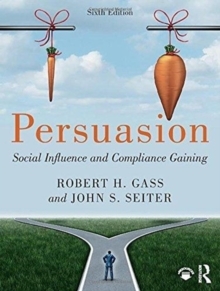 Now in its sixth edition, Persuasion: Social Influence and Compliance Gaining continues to boast an accessible voice and vibrant aesthetic that appeals to undergraduate students of communication, psychology, advertising, and marketing. In addition to presenting established theories and models, this text encourages students to develop and apply general conclusions about persuasion in real-world settings. Along the way, students are introduced to the practice of social influence in an array of contexts (e.g., advertising, marketing, politics, interpersonal relationships, social media, groups) and across a variety of topics (e.g., credibility, personality, deception, motivational appeals, visual persuasion). The new edition features an expanded treatment of digital and social media, up-to-date research on theory and practice, and enhanced discussions of topics such as political campaigning, emotional marketing, olfactory influence, and ethics. Instructors can also use the book's downloadable test bank, instructor's manual, and PowerPoint slides in preparing course material.